We know you're busy, and we know wedding planning is stressful. You're probably juggling a dozen vendors and the thought of adding another makes you cringe. We get it. But you deserve the custom wedding invitations of your dreams without the headache. We know that you may be short on time. With all the things you're planning, it's easy to lose track of things. There are a million wedding invitations out there, but ours aren't cookie cutter. We don't sell mass produced designs for printing at home. We make hand made and high quality invitations to fit your budget, colors and ideas. We work with you every step of the way until you think they are perfect. All these perks (and more!) are included because we appreciate you and believe you shouldn't have to settle for anything less than your dream invitations. We're not going to charge you for every little change in color, font, wording, etc. Why? Because we wouldn't want to be charged for those things. The industry standard is three proofs, and then additional charges for edits. What if you want to see a couple different fonts? Then you have to pay another $25+? No, not with us. Our mission is to make invitations that you love, period. No hidden fees, no additional charges. More than anything, we want you to wholeheartedly LOVE your invitations. It's easy! Look through our samples and see if there are any that just scream your name. Once you have an idea of what you're looking for, we recommend getting a quote. We'll get back to you as soon as we can with pricing, just let us know how many, what you would like included, the style, and when you need them by. You can also receive a quote or ask a question using the chat function below! We require a $50 deposit to begin working on your custom proofs. Unlimited proofs + free font, color and wording changes. ONLY ONE (1) DEPOSIT REQUIRED TO START YOUR ORDER. Do not put the number of invites needed under quantity 🙂 Upon clicking "Start your order," you will be prompted with our order form. Once this is filled out, you can complete the purchase by proceeding to your cart. We will send you your first round proofs within 7 business days, although it generally only takes a day or two. 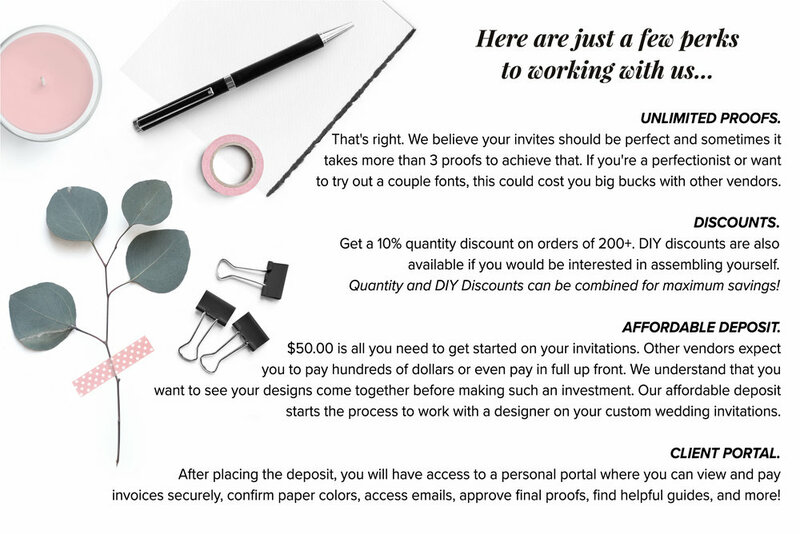 If you'd like to pay an additional $15 for the RUSH option, our designer will move your proofs to the top of her list and have them to you within 2 business days. After the order is started, we will set you up on our Client Portal! Confirm your colors. We will go over the form and conversations we have had with you to confirm your final colors. We send a breakdown of all the product colors, and you simply have to confirm they are correct by submitting the form within the portal! Send Final Proofs. Just to be triple sure, we will send all the proofs you have agreed to one last time. We recommend having a fresh set of eyes look them over before confirming. All you have to do is give us the thumbs up! Final proofs can be found and approved within the portal! Send the Final Payment. Generally after the deposit, clients make 1 or 2 payments. We require half to be paid to order your custom papers, and for it to be paid in full prior to printing. Other than that, we are totally flexible on the number of payments. We know weddings are expensive in a short period of time. If you want to make weekly or monthly payments on your order, we can set that up! Your invoice and original and can be viewed and paid within the portal. You can also access emails and other documents within the portal function. Your invitations will go to printing and we will complete your order! NEW! Now offering Digital Downloads! Contact us to learn more, or visit the link below! If you’re looking for invitations that are not cookie cutter and everything above sounds like a good fit for you, LET’S DO THIS! We’re ready! Let us know below what you’re looking for and we’ll get this started for you! Click the Get Started button above if you’re ready to purchase the deposit, or fill out the form if you have any questions. My daughters invitations came out stunning and we received them several weeks earlier then we thought. From the moment I saw the listing I knew they were exactly what she was looking for at a fraction of the cost. These wedding invitations are absolutely gorgeous! The silver glitter is soft and elegant, the font is lovely and the materials are high quality. Carley was absolutely amazing to work with! I asked many questions, wanted to see different options and she didn't hesitate, she was always responsive, providing samples, suggestions and drafts throughout the process. We are delighted with our invitations, it was a pleasure doing business with CZInvitations! I ordered the blush and gold invitation suite. From start to finish, I can't say enough good things about working with Carley and the invitations themselves. 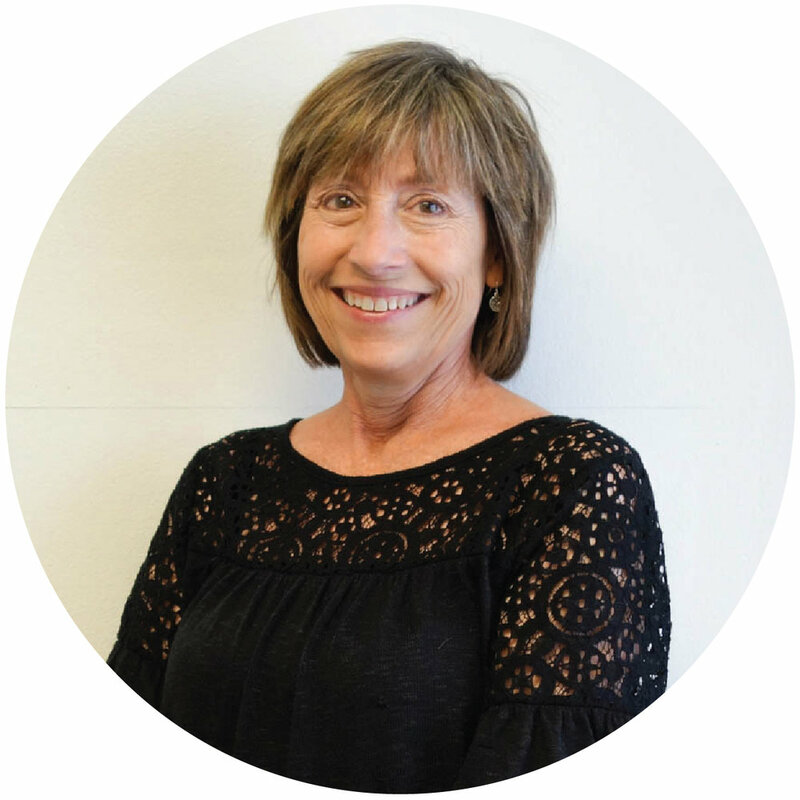 She rushed 145 invitations to me within a week when my initial printer left me in the lurch, and the communication from her and her team was top notch. For my initial invites, I sat down and chose every detail, from the paper weight for each layer to the font. With these, I ordered as is, trusting her judgment and honestly, I'm glad my original brick and mortar store came up short: these invitations are simply gorgeous. The paper quality is beautiful, the packaging was well done, and as a suite, every detail works. I'm beyond happy with the final product and ended up with exactly what I wanted. Order with absolute confidence! I could not be any happier with our custom invitations. From start to finish the team at CZ Invitations helped me pick out the style and colors I wanted making sure every detail was to my liking up until I was ready to place my order. They even sent samples so I could see them in person beforehand. I chose the DIY option and their instructions were simple and easy. Would 100% recommend them to any and everyone! LOOK NO FURTHER......CZ Invitations is an AMAZING Etsy seller!!! Carley & Reagan are over the top!!! We have been in contact with Carley since January and for the past 7 months, Carley has been patient, responsive to our needs & concerns, accommodating and most important honest and did exactly what she said she would do. In the beginning, we were so full of questions. We had never made such a huge decision like invitations with a vendor strictly online before. Carley did not disappoint. From day one, she answered all questions, was prompt with the replies to our concerns and when she said the invites would be sent-she was right on target! The shipment was carefully boxed with particular detail to receiving the items unscathed! We are in LOVE with the invites and will use Carley AGAIN! Thank you!!! We are BEYOND HAPPY !!!! Orders take on average 6-8 weeks. This includes proofs, printing, and assembly (if applicable). Absolutely! When filling out the form, indicate that you need to rush your order, and when you need it by. Please note, the quickest we are able to complete a full order during our busy season is 3 weeks. Rush orders do require a minimum rush order fee. The rush fee will depend on the size of the order, time of production, design/pieces of the invitation, as well as our current work load. Please ask to get an accurate quote for a rush order, as all jobs will vary. Yes, changing colors is always FREE! All of our invitations are available in any of our 130 paper and envelope colors. For glitter and mirror papers, we offer Gold, Rose Gold and Silver. All glitter and mirror colors are available in mats, belly bands, and envelope liners. See all colors available. The price displayed on the sample page is the price per invitation. Please request a quote. We do offer DIY and quantity discounts. Will my invitations come assembled? Yes. The pricing you see includes assembly of the invitation, pocket and belly band. For pockets, the inserts will not be in the pockets. We do offer Do-it-yourself options at a discount. Envelope liners are the only thing unassembled for the listed price. Upgrades are available for assembled envelope liners. 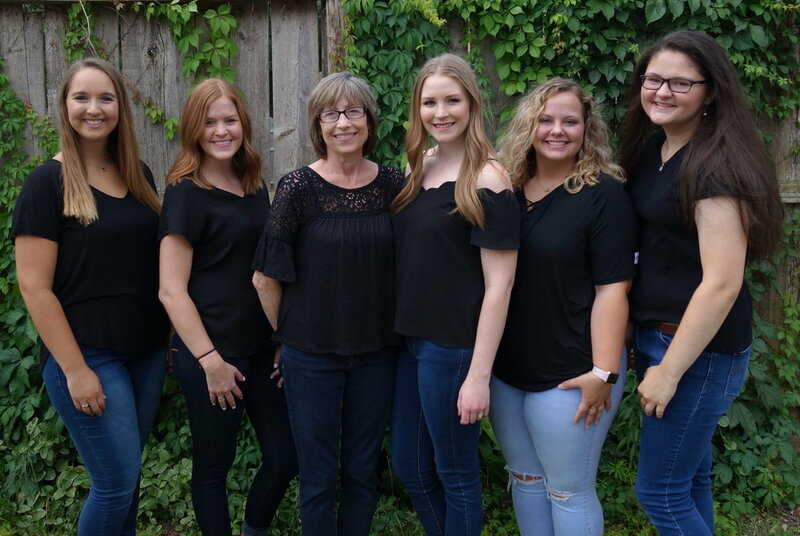 We're a mother daughter team making your invitation dreams come true! We have a great group of women working hard on every invitation from start to finish. If you're ready to start your custom invitations, we're here to help!